Even the most careful cook among us can’t help getting stains on the hob. 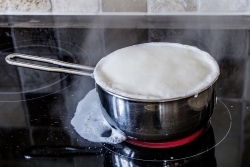 Whether it’s tomato sauce splatters or a pan of pasta boiling over, food residue can burn and mark the hob, and most of us don’t have time to wipe it down every night. Plus, glass and ceramic hobs are particularly tricky to clean, because it’s easy to scratch the surface, leaving swirl marks and a dull finish. But the good news is that cleaning the hob is so much easier when you’re using the right product. A specially formulated hob cleaner is designed to cut through tough stains and burnt-on food, meaning that you don’t need to scrub at the hob, which reduces the risk of scratching the surface. 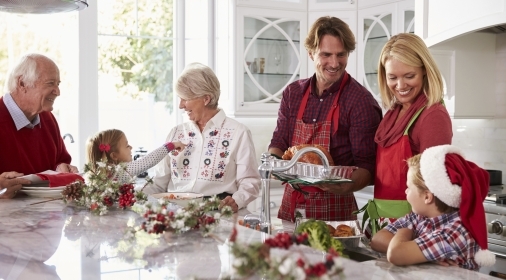 These cleaners will also remove cooking grease to leave a clear, shiny finish. That’s why we recommend that you always use a specially formulated ceramic hob cleaner, which isn’t grainy or abrasive and won’t scratch the surface. One such product is Hob Brite Ceramic Hob Cleaner, which is regularly recommended and, at around £2 per bottle, is great value too. Here’s a guide to Hob Brite and how to use it on your hob. 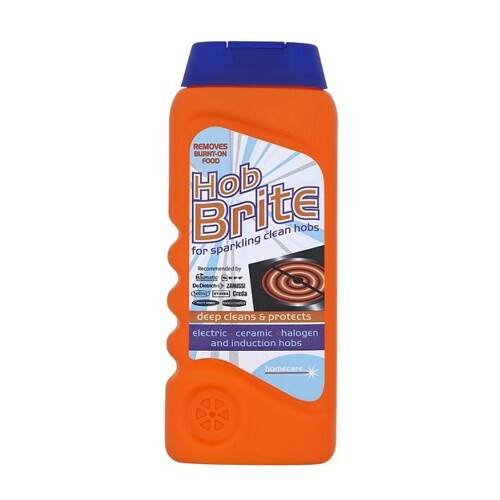 Hob Brite is one of the most popular hob cleaners in the UK, and you may recognise its vibrant orange packaging. It is a non-scratch cream cleaner that has a powerful formula designed to cut through the toughest burnt-on food, removing stains and cooking residue, leaving your hob sparkling clean. If you use it regularly, Hob Brite will also build up an invisible film that protects against staining. Plus the cleaner is antibacterial, killing 99% of bacteria. What can I use Hob Brite on? Hob Brite is a hob cleaner that is specially formulated to be used on a range of delicate surfaces, including ceramic, electric, halogen and induction hobs. It’s recommended by leading hob and oven manufacturers, including Neff, Stoves, Creda, Belling, Tricity Bendix, Zanussi, Baumatic and Rangemaster. Note: Always read the instructions carefully before using any cleaning product, and follow any safety precautions. These steps should be enough to get your hob sparkling clean. However, for heavy staining, you may need to repeat applications. Need more elbow grease? Try rubbing the cleaner in with a scrunched up ball of newspaper. Test it on a small area first and check for scratches. 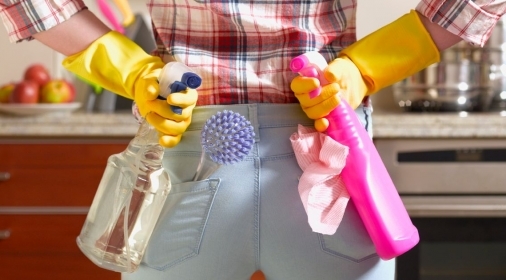 Never use wire scrubbers or Brillo pads to remove residues. Some persistent residues and burnt-on food like sugar can be difficult to remove, even with the best hob cleaner. In this case, you may need a scraper tool. Specialist ceramic hob scrapers allow you to get under the residue to shift it, but they should be used with care so you don’t scratch the surface. Apply the Hob Brite cleaner and wait until it starts to soak in, and then use the scraper to remove the residue. Use short, gentle strokes and stop regularly to check for scratches. If you’d rather let the professionals tackle your hob cleaning, Ovenclean can help! 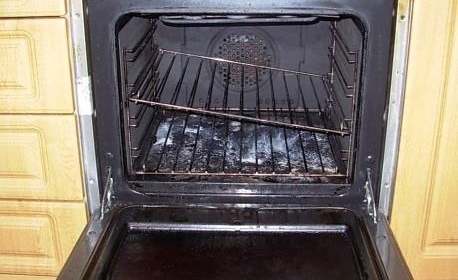 Our specialists can clean your oven, hob and extractor fan, among other items, with our non-caustic solution, leaving everything sparkling clean. Call us on 0800 840 7127, or complete our online form for your free quote.